As the tagline of this research blog suggests, its interests are threefold: extreme sports, environmentalism, and gender. Since the literary-academic extension of environmentalism, ecocriticism, is probably the least well known of the three fields of research where my study is placed, it might be beneficial to briefly introduce it here. I will then in upcoming posts introduce the other two fields of research that my study concerns, namely sports sociology and gender studies. These introductions will necessarily be quite short and shallow as I want to keep these posts at a manageable length, but I will probably write on a more detailed level on various issues within these broad fields in the future. Ecocriticism is the umbrella term for a wide variety of different types of humanities research that place nature at their center, but in its classical form, it is the study of literature and the environment. Environmentalists such as John Muir had decried humanity’s increasing encroachment upon nature since the 19th century and Aldo Leopold’s Sand County Almanac had continued that trend. But the environmental movement gained significant momentum in the 1960s with such groundbreaking works as Rachel Carson’s Silent Spring. Following the growing environmental awareness of the decades since the 1960s brought by Carson et al., ecocriticism proper is often seen to have been ‘born’ in the 1990s in the literature departments of universities in the Anglo-American world. This birth essentially resulted from the recognition within academia that while issues such as class, race, and gender had received much scholarly attention, the very real and material world that both surrounds us and that we ourselves are part of, i.e. nature, hadn’t received similar interest. In the beginning ecocriticism often centered on issues concerning how nature is represented in classic (think Wordsworth, Shakespeare, etc.) literature but it has since expanded to not only study basically all types of media (like I do) but also started to study the wider implications of all the interactions that humans have with non-human nature, such as in Lawrence Buell’s The Future of Environmental Criticism. These new directions have taken ecocriticism quite far from its origins in literature (even if literature is understood in very broad terms as encompassing almost any kinds of texts) into the fields of cultural studies, social sciences, and philosophy. This has also led to it becoming in closer interdisciplinary contact with other, non literature-focused fields outside the humanities, such as environmental studies. While ecocritics often* share an implicitly environmentalist and ethically motivated** (and thus political) attitude towards their research, the same cannot necessarily be said of environmental studies. In most (but not all, see, e.g. Hacettepe University) environmental studies programs nature is seen as a “resource” to be tehcnologically managed by humans and not necessarily an entity of inherent value (see, e.g. UC Boulder). This is not to detract in any way from the valuable practical work carried out in those programs but it is markedly different from the most common ecocritical starting point. There is also a “third way” that partly bridges this gap, namely environmental humanities. This field is vastly interdisciplinary, and combines humanities research into technology (as in, e.g. Linköping University). Ecocriticism and Italy reads Italy as a text – a compound text made of matter and imagination – always keeping in mind the link between the horizon of this country and the world’s larger ecology of ideas and matter. 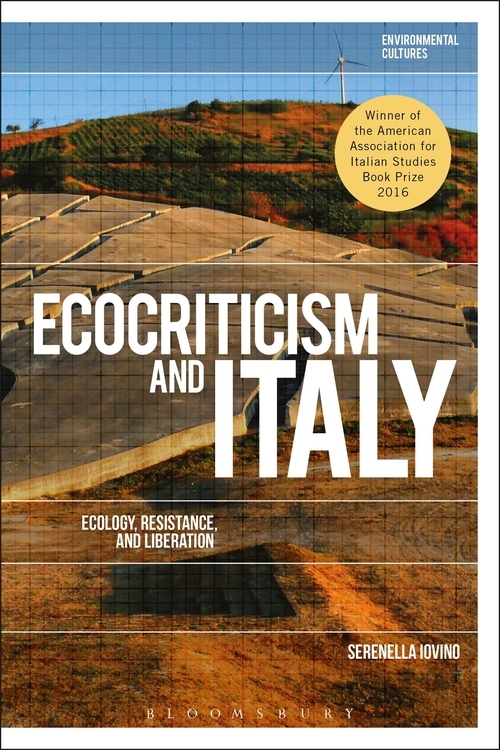 Challenging stereotypes and ambivalent clichés, this book uses ecocriticism as a way to give voice to the forces, wounds, and messages of creativity dispersed on Italy’s body, arguing that a literature, an art, and a criticism that are able to transform these unexpressed voices into stories – into our stories – are not only ways to resist. They are a practice of liberation. Credit: bloomsbury.com, book available from all the usual suspects. *At least I’ve never come across any kind of ecocritical research that would advocate more clearcut logging, more consumption, more neoliberalism, etc. **Ecocriticism can thus be seen to belong to the “emancipatory” branch of knowledge as outlined by Habermas, the other two being “work” knowledge, i.e. technical research that seeks to control nature (see Keller for a more in-depth analysis of the gendered nature of technical science) and “practical” knowledge, e.g. social sciences, law, etc. Applying emancipatory knowledge often entails critically examining current human/non-human/society relationships and based on that critical examination offering alternative ways of organizing those relationships, or simply exposing the taken-for-granted nature of those established relationships. In this, a similar research process is usually followed as in, e.g. the technical sciences, where a data set is studied and then conclusions (sometimes recommendations) drawn based on that study. Technical sciences that may sometimes be thought of as being somehow more “objective” than some other branches of research can, of course, also be politically motivated (examples abound in, e.g. biology). NB! This is a vast oversimplification of the three types of knowledge and another instance where I play the “keeping these blog posts at a manageable length” card. ***Caveat emptor: I haven’t yet read the book myself but seeing that it is written by a highly acclaimed ecocritic Serenella Iovino, I trust that it is at least interesting. Keller, Evelyn Fox: Reflections on Gender and Science.